We are a full service web design company providing affordable internet and marketing services to owners of vacation rental properties. 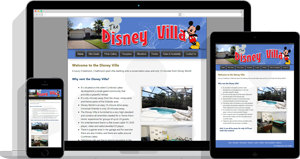 No matter where your vacation property is located - Florida, USA or the rest of the World - we can design a website just for you. We have been creating websites since 1999, have owned rental properties ourselves, and have all the experience you need. Our Designs will Work Beautifully on All Desktops, Smartphones and Mobile Devices and are readable without having to "pinch/zoom". As the owner of a vacation rental property you may be contemplating the most effective method of marketing your home to maximize rentals. A presence on the internet is essential for any rental home owner wishing to manage their own bookings. FVOS can provide you with a number of internet marketing packages to suit your needs. Whether it is a new website, a redesign of an existing site, or changes to your current website we can help. For owners who would like to be more "hands-off" and leave bookings to others our "Preferred Rental Program" might be an ideal solution. Here is a summary of some of the services we offer. You can also use the menu above to navigate through our website. ... Totally impressed with their work on the photos, we hired them to build our website too and once again, we saw their magical touch in it. FVOS are professional in meeting deadlines and offering valuable suggestions that ease our job as customers. Their working style is both friendly and focused to go beyond the customer's expectations. We are glad that we found them and will gladly recommend them to anyone who is in need of web marketing and media for an affordable price... (full testimonial here). After a few simple questions, FVOS was able to create a web site that is exactly what I had in mind! The FVOS Staff were true professionals, making every aspect of the process enjoyable. I especially appreciated their prompt and courteous responses to my questions and ideas, as silly as they may have sounded to them at the time! I would highly recommend FVOS to anyone interested in creating the perfect web site for their vacation property!